As with any racing event autumn racing is about keeping things sleek and simple. Women’s suiting is still a front runner, yet this season we are seeing a more structured style with waist belts and cinched in blazers, or cropped style blazers to add a more feminine touch. Separates are also a great option allowing racegoers to mix it up and re-wear items after race day – it’s a great way to keep the budget intact. In terms of dresses, this season it’s all about volume, a dress with a statement sleeve or skirt adding that extra wow factor. Colour-wise we are seeing lots of shades of orange, yellow, burgundy, pink as well as strong neutrals. 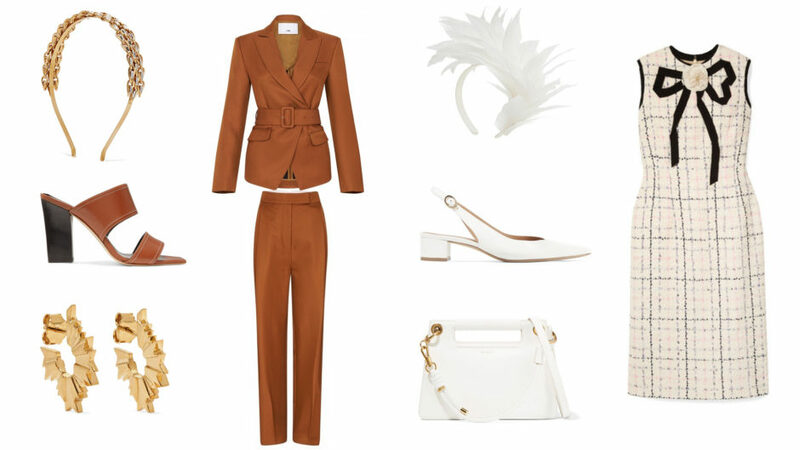 Opt for elegant pieces and experiment with autumnal shades and textures. On cooler days, embrace layering by pairing a beautiful dress with a blazer or coat, and be sure to keep headwear top of mind. This season we are seeing a lot of simple hair clips, velvet and metallic headbands, however traditional felt hats and crowns are still very popular so there are plenty of options. If you’re heading to an autumn racing event consider some of these pieces to style the ideal look. Sometimes I just feel like embracing my girly side and this outfit was the perfect opportunity to do it. 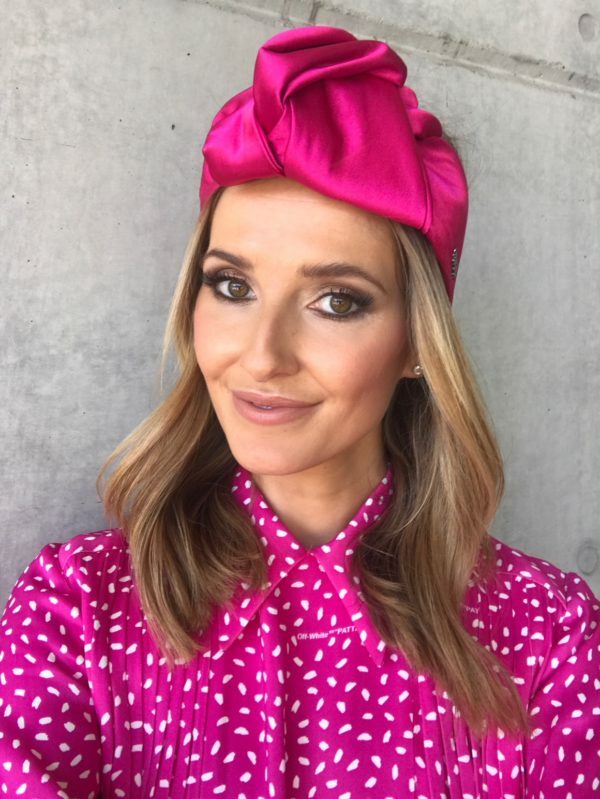 During a recent reporting gig for 7 Racing on day two of The Championships in Sydney I wanted to wear something striking. What better colour to do that than hot pink? This polka dot Off White dress managed to take such a classic style and steer it in a slighly more playful direction with the asymmetric handkerchief hem and bow tie cuffs. The pin tuck detail also add some depth to the top of the dress. 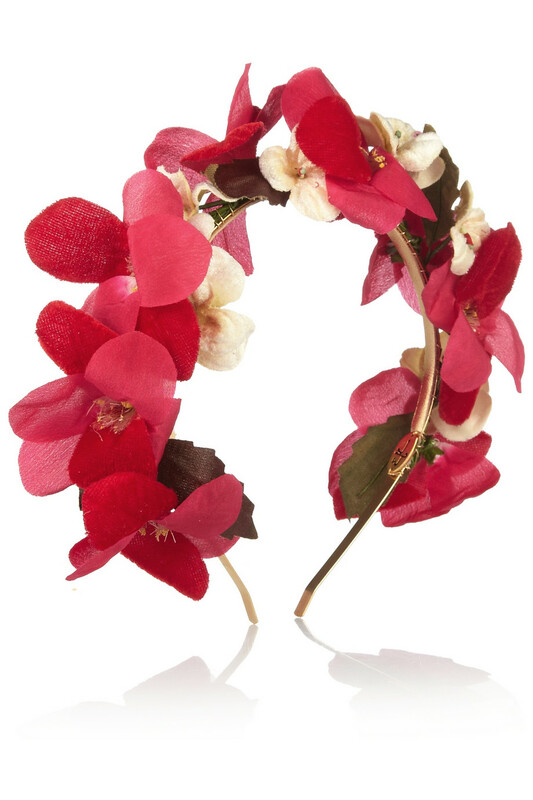 I wanted to keep the same colour theme going so this Nerida Winter turban seemed the ideal headpiece. 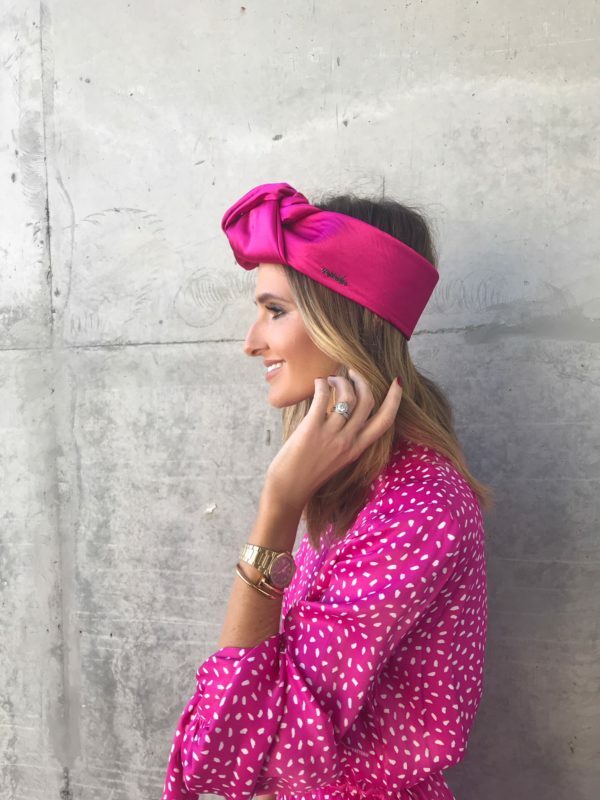 I can’t get enough of turbans (I’ve worn variations of them to Melbourne Cup) as headwear for the races. There’s just something quite different about them and is a great alternative to the usual silhouettes you see. Also when the colour matched my dress so perfectly how could I resist? Pink is one of those colours that can work well with different hues (black and white come to mind) but I can’t resist teaming it with a metallic. My gold Gucci heels helped provide a contrasting colour without it looking overwhelming. Given the strong colour of the dress it was important for me to allow it to be the focal point but still pair it with accessories that could hold their own.